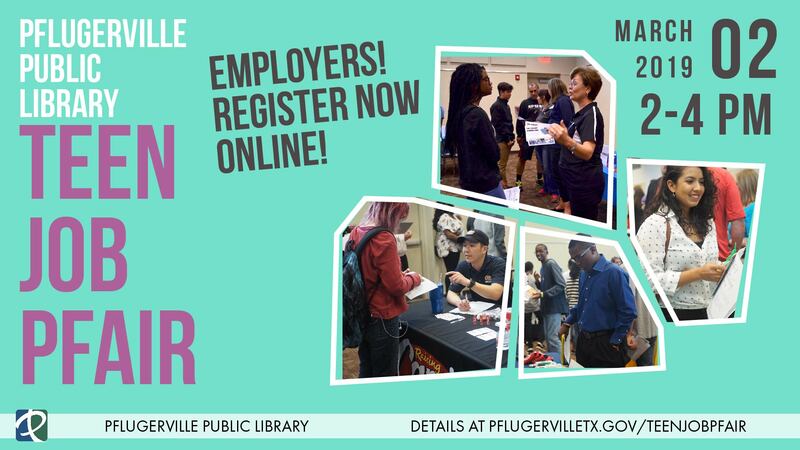 The Pflugerville Public Library will host the 4th annual Teen Job Pfair on March 2, 2019. Local employers and organizations with volunteer opportunities and internships are invited to participate. This event is an excellent opportunity to meet eager young prospective employees. Participating employers that register by January 31 will be included on print and online advertising. The final registration deadline for employers is February 15. Online registration is available at www.pflugervilletx.gov/TeenJobPfair. For more information, please contact Amanda Cawthon at amandac@pflugervilletx.gov or 512-990-6375.